Chez Lannis: How do you lose digital photos? Yeah... no real explanation, other than that the time date stamp is January 28th around 2pm. I vaguely recall photographing this beastie for a blog post and I can't for the life of me conjure up the reasoning behind it other than that he was new at the time. Long story very short: I was at the grocery store with four kids and the front end manager handed us a boxed set of Ray Harryhausen flicks with this guy in the box—for free. Apparently they were resorting to literally giving away the set. The kidlets immediately latched on to this friendly guy and were thrilled. 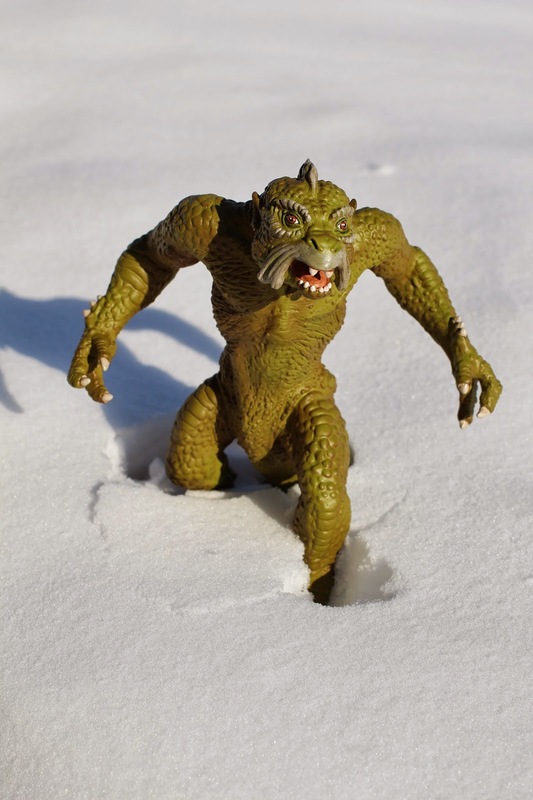 I mean, clearly I had an epic story about him—LOOK at him!—crouched in the snow, snarling away for all his might. Hell, I took multiple photos! WE ARE ALL MISSING OUT ON SOMETHING EPIC, PEOPLE!